How were Camels used in the United States Camel Corps and Why did the Army Experiment End? Camels actually have quite a long history in the United States. Many natural history experts believe camels actually originated in North America 40 million years ago and migrated north and west through Alaska and into Asia along with many other large animals prior to the Ice Age. More recently, though, camels were used as pack animals in the deserts of the western United States. In 1855 then secretary of war Jefferson Davis appealed to Congress for money to purchase camels so the army could build a wagon trail from Texas to Colorado. Congress consented and gave the U.S. Army $30,000 for the purchase and transport of seventy-seven camels to Texas from the Middle East, along with a native fellow named Hadji Ali to help lead the camel caravans. Sadly, the Americans didn’t try very hard to correctly pronounce his name, and he ended up being forever remembered in the history books as Hi Jolly. In fact, you can see his pyramid-shaped grave with the name Hi Jolly if you pull off the interstate in Quartzsite, Arizona. How did the camels do? The rocky American desert soil was different from the sand dunes the camels were accustomed to, and harder for them to navigate. Also, the camels sometimes spooked the American troops and their donkeys. But despite these setbacks, the camels worked out pretty well. When the secretary of war requested funds from Congress in 1858 for 1,000 more camels, it looked like the camel might become a fixture of the American West. However, brewing tensions between the North and the South were monopolizing the government’s attention. The funds were never appropriated, and the army camel experiment died a quiet death. Camels were used to map out a couple of specific western regions as late as 1860, but most of them were auctioned off or let loose in the desert, many to be shot by miners as pests. 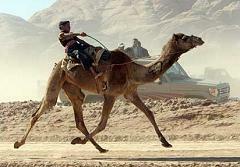 Today there are small camel trekking companies that will take you on tours. One leads small caravans through the Big Bend expedition trail that was carved out by Lieutenant William Echols in the late 1850s with camels by his side. Tour guides narrate the history of the army camel experiment along the way while the camel below you adds its own commentary. Did the U.S. Army Ever Have a Camel Corps? What was the Tuskegee Experiment and When did the Tuskegee Experiment take place?